Oliver's uses original family proven recipes, the very best ingredients, including real butter, cream, honey and other natural products. This, along with the skilled experience of the master candy maker, is a guarantee of continued success. Oliver's top seven employees have over 220 years accumulative service of loyalty and adherence to quality and customer service. A picture of the marquee under the Oliver's Candies sign has been making the rounds on Facebook. Is "Molly Pops" a mistake, people want to know. A molly pop, according to general manager Jeremy Liles, is a "peppermint molasses sucker covered with chocolate." And he adds, "Very good stuff!" That's a nominee for understatement of the year. I stopped by late today to get a picture and as I left, an Oliver's employee offered to let me take a sample sucker. I took my first bite as I walked through the parking lot toward my truck. I immediately turned on my heel and headed back into the store. I bought a package of eight. Tonight, I shared one with Billie. She insisted that I share the rest. "It's terribly delicious," she said. This is one of a series of articles highlighting the winners of the Genesee County Chamber of Commerce awards for 2012. The awards gala is Saturday evening at the Clarion Hotel. Whether it's the salty, sweet perfection of Cashew Glaze, colorful Christmas Ribbon Candy or the unique regional favorite Sponge Candy, Oliver's offers treats that are handmade, high quality and tasty. For 81 years now, the Batavia landmark has built a loyal following that, aided by a robust online presence, today includes customers everywhere from Irondequoit to Korea, France to Corfu. Oliver's Candies, LLC, is the Genesee County Chamber of Commerce 2012 Business of the Year. Located at 211 W. Main St., the Swiss-chalet-style building is where founder Joe Oliver lived and operated his candy shop. It had add-ons built in the '50s, '70s and major upgrades a couple of years after John and Sheila Quincey bought it in 1998. Sheila's son, Jeremy Liles, came on board in 2001 and is general manager. "It's exciting being named Business of the Year and we appreciate the recognition of other business people," Liles said. He credits his parents and staff, past and present, with Oliver's continued success. "I didn't build this business to where it is today," Liles said. "My parents took a business that was doing OK in the '90s -- it was surviving -- but they just made it boom. They put their own money into it. They said this is something that can really grow and do a lot." 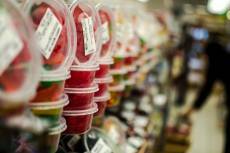 In 2000, the candy-making facility was completely revamped. The size of the retail store was tripled -- now it's about 3,000-square-feet -- and the size of the kitchen was doubled. There are no ovens. All the candy is made using commercial-grade, air-induction stoves and giant copper kettles. In 2002, "a full-blown ice cream parlor" was cranking out cones of ice cream blended especially for Oliver's. Making candy isn't like running a restaurant. Although goods are being made fresh all the time, the process is more like manufacturing and can be done in shifts. And there's a shelf life, unlike what comes to a cafe table hot on a dinner plate. But as with restaurants, running a successful candy operation requires "a lot of devotion." And the toil and talent of a capable staff. "Those guys in the kitchen make it happen," said Liles, who is 38 and the father of three. "They're the backbone of the business." A number of employees have spent a good chunk of their lives working at Oliver's. Bob Pacer, with about 34 years of service, and Bonnie Battaglia, with about 33, both retired earlier this year. Their knowledge of candy and customers and their skills are no doubt sorely missed. Then there's retail manager Diana Cuttita, with 20-plus years, and Beth Diegelman, 33-plus years. 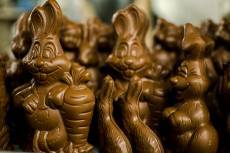 "Beth can hand-temper chocolate," said Liles, with a little awe in his voice. "I can't do that, a machine can. But her hands are just cold enough to be able to get just the right consistency by hand." It takes years to learn that kind of stuff. In fact, it takes about 10 years to become a master candy maker and it's typically learned through apprenticeship. Ron Drock, who worked at Oliver's for 51 years, learned from his predecessor and he taught current master candy maker and longtime employee Doug Pastecki. Adam Horton is the assistant candy maker learning all he can from Doug. There are currently about 15 full-time staff people and 15 part-timers, including seasonal workers, high school and college students, and crews for nights, weekends and summer. "Thank God for them," Liles says, noting that they get to hone some practical math skills like counting back change, converting ounces to pounds or the fact that there are three teaspoons in one tablespoon. As for increasing sales, Liles says two factors are key (A) consistent store hours and (B) having a successful online shopping site. "We're open from 9 a.m. to 9 p.m., seven days a week, and we're only closed on Christmas Day and Easter Sunday. If you're not open, how can you sell?" Their online sales have soared. Online is a great way to expand sales without going the brick-and-mortar route. In addition, they are selling favorites like Merry Mints, French Creams, Sponge Candy and Cashew Glaze wholesale to national catalog order companies, something which has "become huge" for them. In terms of challenges, besides small business depressors like high taxes and minimum wage increases, commodity fluctuations can have an impact on them. Higher prices for sugar and cocoa, for instance, are somewhat offset by product-line diversity -- no-added sugar products, savory snack mixes, and candies that don't require chocolate. "If something happens on the Ivory Coast because of politics, it can affect us because that's where our cocoa is coming from. Normally it's not a problem because the United States imports so much of it; we can get our hands on it. But we're not as big as Hershey's. They have their own plantations. We depend on small growers. "So if our costs shoot up, we're not like the gas station across the street -- we can't raise and lower our prices all the time. We (small business candy makers) have set a standard -- we're the same price as anybody else in Western New York." "Some people don't understand that and they go in Oliver's and say 'This is expensive. I can get this cheaper at Walmart.' But it's really a different ball game altogether. We're dealing with really high-quality products, no preservatives, fresh made. There's a huge difference. I think people realize that and that is why our customer base is what it is and growing. "I think people are acquiring the taste for finer chocolates, finer wines, whatever, and (the trend of) Shop Local." And Oliver's does shop local whenever possible, whether it's buying dairy products from Oatka, kitchen wares from Batavia Restaurant Supply, or seasonal produce from Harrington's and farmer's markets. Liles is encouraged by Batavia's potential and what lies on the horizon and says the future looks sweet. Things already are at Oliver's. 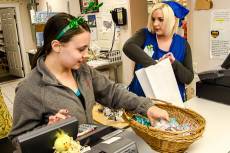 The Easter Bunny hopped into Oliver's Candies today, and he had lots of candy for lots of children. Oliver's Candies was packed today with kids and parents for Santa's annual visit to the store. Outside there was also a petting zoo and the Batavia Jaycees sold hot dogs and local Girl Scouts sold cookies. While you may still be thinking about Halloween candy, the folks at Oliver's need to think decidedly further ahead -- like Christmas. Candy cane production started today. Here are a few photos of the process. 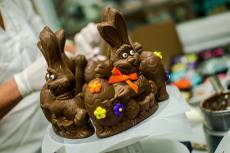 The Easter Bunny made his annual appearance at Oliver's Candies on West Main Street, Batavia, on Saturday. Santa Claus passed through Batavia today, making a stop at Oliver's Candies (I've also heard that he stopped at Present Tense Books, but I didn't find that out until later). While Santa was in the sweets shop, the Batavia Area Jaycees were outside selling hot dogs and running a petting zoo. It's been non-stop kids since 11 a.m. at Oliver's Candies, where the Jelly Belly RV made a stop today. The RV will be at Oliver's until 3 p.m.
Oliver's Candies is just the spot to pick up fine chocolates made from the freshest ingredients. Take home their famous sponge candy. For the holidays, try their homemade ribbon candy! 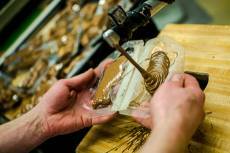 People travel for miles to visit Oliver's Candies in Batavia, NY. So many mouth-watering items to choose from, no matter what time of the year. Here are the sights and sounds of the Oliver's Candies candy kitchen. I love that they have deliciousness for every season. I love their samples. Their chocolate tastes fresh. I can't even eat any store bought candies anymore unless it is bought at Olivers. Best sponge candy ever!!! Melts in your mouth..delicious. I love the creamy chocolate there. I love how they offer to wrap items if they are gifts, and they often have free samples, yum! Best place in WNY to get Chocolate! Sponge Candy is my ultimate favorite and they have the BEST!!! A Batavia institution and a treasure. Love the chocolate choices. Everything is delicious.